Every Londoner knows what a pain in the backside it is hailing a taxi in the capital. But for Government Ministers, it's not a problem! 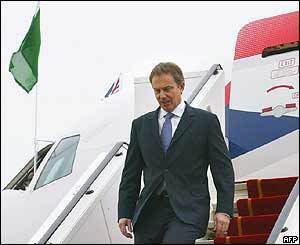 Some of Labour's critics have accused Tony Blair and his Minister's of using the Queen's flight - a fleet of RAF planes - as a 'taxi service'. The PM has used the jets more than 670 times since 1997, and Environment Minister Margaret Beckett is also a frequent flyer, often getting the pilots to stop off in her constituency on the way to Brussels. The Tories and Lib Dems have called for all flights on the planes to be made public, with Tory Shadow Transport Secretary Chris Grayling claiming that the public would be shocked if they knew the extent to which Ministers are using the Queen's flight as a private taxi service. Council Worker Union Unison have called for a suspension of striking over pensions for local council workers. Last month, over a million council workers went on strike countrywide, but Unison have now agreed to a framework of negotiation, and future strike dates have been postponed for now.